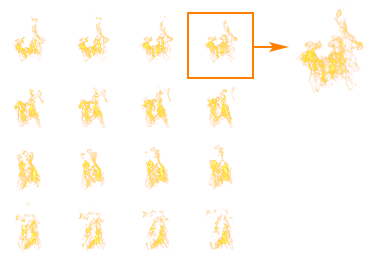 A particles_base material is used for particles. 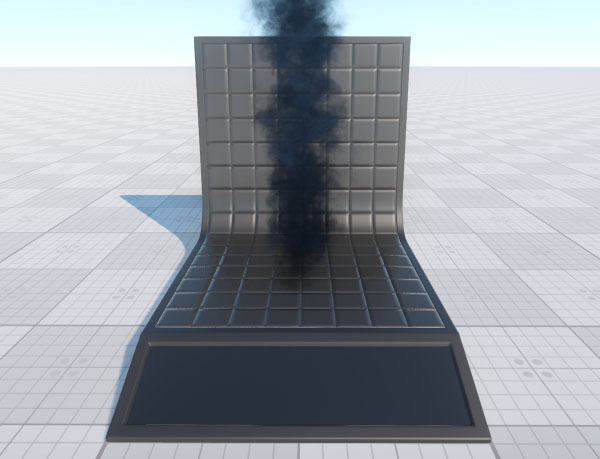 This material supports particles animation. Deferred Buffers specifies if the material should be rendered during the deferred pass. Auxiliary specifies if the material should be rendered into the auxiliary color buffer to create a custom post-process effect. Refraction specifies if the material should be rendered during the refraction pass. 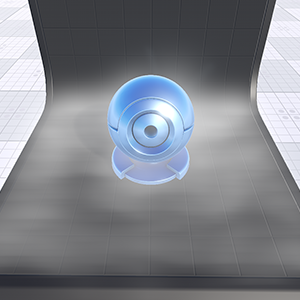 Surfaces will be rendered during this pass only if they are transparent. 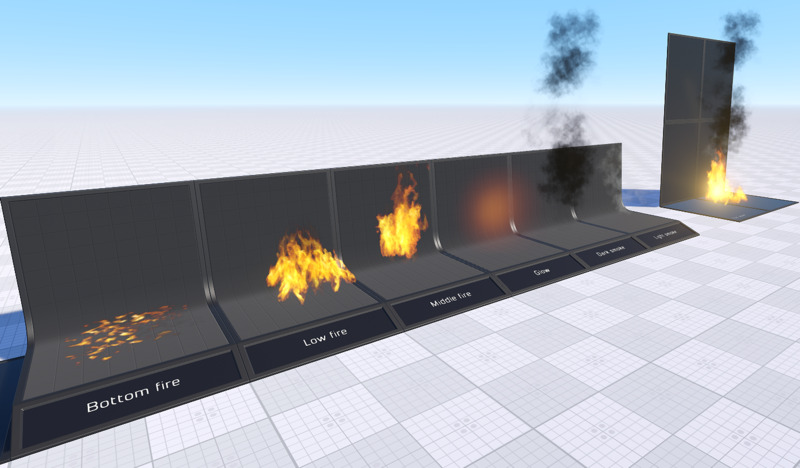 Specifies if a texture with an atlas animation will be used as a diffuse one. If the depth value specifies, that the particles are in front or behind the object, they are rendered as usual. If the depth value between the cloud and the object is small, the color is smoothly interpolated. The depth value can be set using the Interaction parameter. This option allows avoiding moire patterns on the objects. Specifies if alpha fading between surfaces is used. 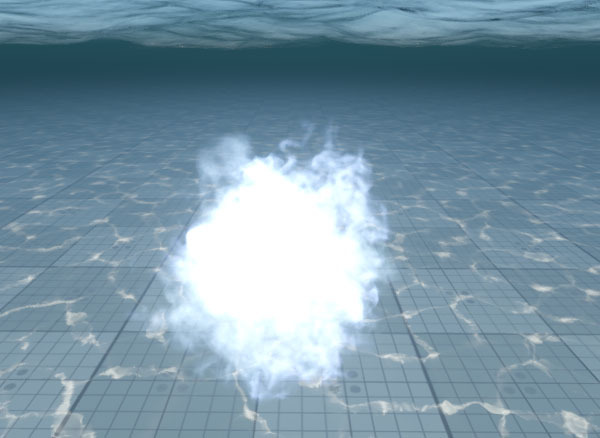 Disables rendering of particles underwater. 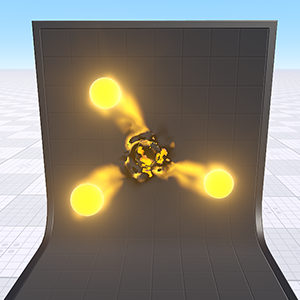 Specifies whether the particle system is affected by lighting baked into Voxel Probes. 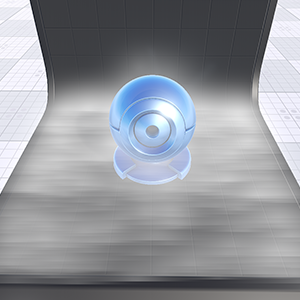 Enables rendering of the transparent blur effect, which can be used to create a heat haze effect typical for hot air. Rendering -> Transparent -> Blur option must be enabled. Ambient specifies if the material should be rendered during the ambient light pass. 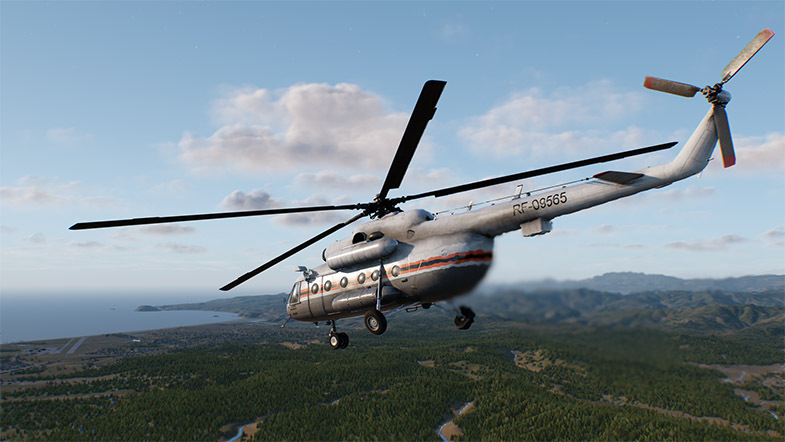 Note that only transparent surfaces will be rendered. Light Omni specifies if the material should be rendered illuminated by the Omni light sources during the shadow maps rendering. Note that only transparent surfaces will be rendered. Light Proj specifies if the material should be rendered illuminated by the Projected light sources during the shadow maps rendering. Note that only transparent surfaces will be rendered. Light World specifies if the material should be rendered illuminated by the World light sources during the shadow maps rendering. Note that only transparent surfaces will be rendered. Specifies if polygons, to which the material is applied, don't receive shadows from omni, projected or cubemap (environment probe) light sources. Specifies if polygons, to which the material is applied, don't receive shadows from world light sources. Soft Shadows toggles rendering of soft shadows on and off. When enabled, the shadows become blurred on the edges. Omni Shadow Jitter toggles jittering of shadows casted by omni lights on and off. Lerp Cascades toggles linear interpolation of shadows cascades on and off. When enabled, transitions between cascades become smoother. However, the option drops performance, as in the transition parts 2 shadow maps are rendered. 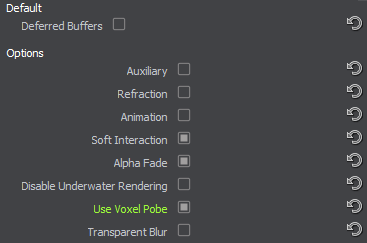 Base textures are loaded and modified in the Base field of the Textures tab. 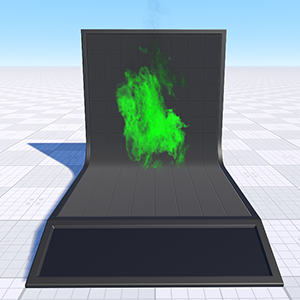 Diffuse map. A texture to define a surface's main color. 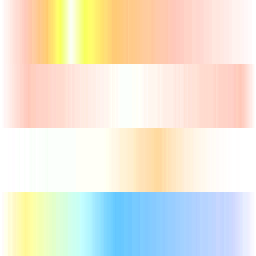 RGB values store a color of the texture. An alpha (A) value contains transparency values. 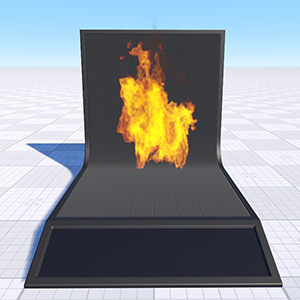 The diffuse texture can also store an animation atlas that is used to play animated particles (for example, the burning fire). 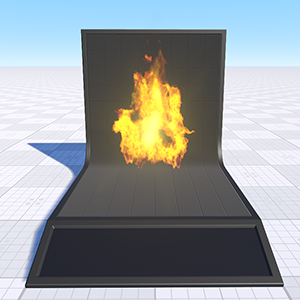 To play animation, enable the Animation texture option in the States tab of the material. Attenuation map. A texture to define the color and alpha component change throughout the particle's life time, from left to right. An attenuation texture can be represented as a set of several textures. By using the 4th component of the Animation parameter you can specify which texture to use for the material. 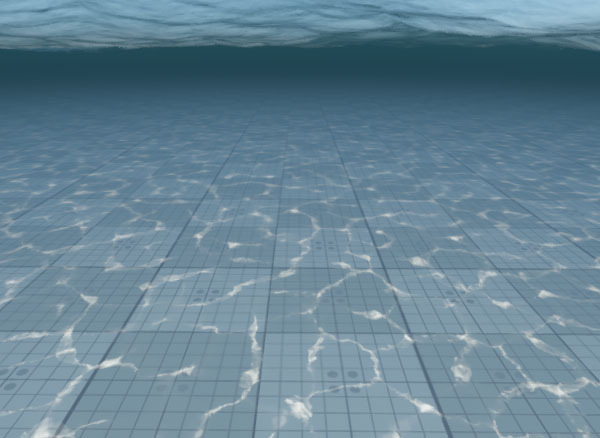 An additional normal texture is present only if a Refraction pass of the States tab is enabled. Normal map. A texture to store information about a surface's normals deviation. Material Mask parameter specifies a decal bit-mask. If the material mask of the decal material matches the particle material, the decal will be projected. Diffuse is a color picker to choose the color of the diffuse map. A coefficient to scale the brightness of the diffuse map. The higher the value, the brighter the diffuse map is. Emission Scale is a multiplier for material's emission. Environment Scale is a multiplier for ambient lighting. X, Y - the size of the texture with the atlas animation along the X and Y axes. Z - the scale of the animation playback speed. W - Y coordinate of the attenuation texture. A threshold for the alpha component for the deferred pass. 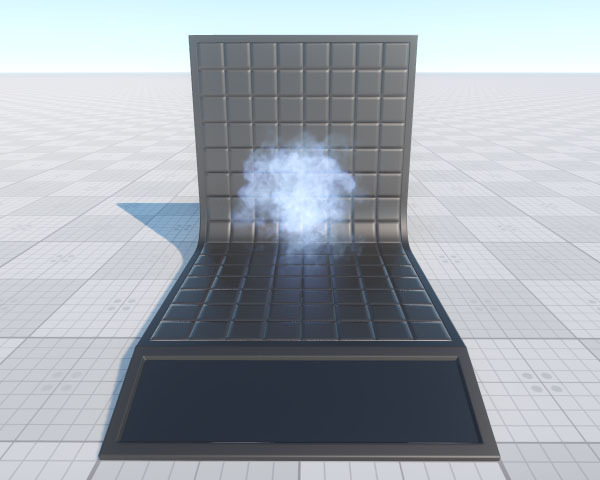 If the alpha component is greater than this value, the particle will be written into the deferred buffer. Auxiliary color parameter is present only if an Auxiliary pass is enabled. The parameter is modified in the Auxiliary field of the Parameters tab. A color picker to choose an auxiliary color for the Auxiliary rendering pass. A threshold for the alpha component for the auxiliary pass. If the alpha component is greater than this value, the particle will be written into the auxiliary buffer. 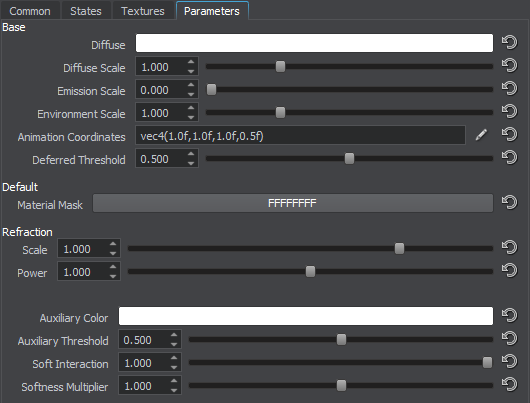 Soft interaction parameters are present only if a Soft interaction option is enabled in theStates tab. Decreasing the value results in rendering in full color of those particles, which are positioned far from the objects. By 0 value, the depth value is considered to be infinity, and thus no particles will be rendered. All of them will be interpolated with the environment. Increasing the value results in rendering in full color more closely positioned particles. The interpolated area lessens. Softness Multiplier is a multiplier for shadows softness. Refraction parameters are present only if the Refraction pass is enabled in the States tab. A coefficient to scale the refraction area. By the value of 0 there is no refraction of the light for the material. The higher the positive value, the more distorted the image behind the refracting material is. Negative values invert the direction of distortion: the lower the negative value, the bigger a distortion is. A coefficient to scale the refraction post-processing power. The higher the value, the less intensive (softer) refraction will be.